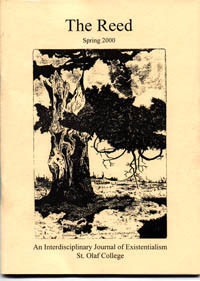 The Reed is an interdisciplinary undergraduate journal of Existentialism published by students of St. Olaf College. Existentialism, as we understand it, has been perennially concerned with relating philosophical issues back to the human. Based on the state of contemporary philosophy–and its relative ignorance of the topic–we believe it is important to emphasize today the significance of Existential thought. With the apparent craving in our society for self-help programs, ethics courses, social activist groups, et cetera, there is an apparent demand for philosophy that can inform the individual. We see Existentialism as filling this void, as a link between abstract philosophical theories and systems and human action and meaning. Distinct from both Analytic and Continental thought, yet cooperative with both, Existentialism offers a unique and needed path for exploring the philosophical issues that matter to human beings. The Reed functions as a forum for Existential themes at the undergraduate level. While existentialism is an area that can be explored within the context of a wide array of mediums, we focus primarily on academic essays and short stories as these are most conducive to our journalistic goals. We hope that The Reed will continue to grow as it taps into all the manifold existing demands for Existentialism in the world today.